There I was all alone in the grey hues of the early morn, when the lord called my name. It was exactly like the sound of a water kettle whistling. I answered, “Yes, Lord?” and suddenly the coffee was done. First of all, I must give credit and thanks to my good friend Dan Berkey, SV Karvi. His level of electrical theory and understanding has been a huge influence in my decision to upgrade to this new technology. His knowledge, support and assistance is greatly appreciated. The discussion of changing existing conventional lead acid batteries to LiFePo4 type batteries began in late 2015. During the early months it seemed like more talk than an actual reality. Part of that is to due to the mystique and my lack of knowledge about LiFePo4 battery systems. I was still in Puerto Vallarta with plans to return to San Diego, CA for some maintenance and system upgrades including a battery system change over. Honestly, the more I read and researched the LiFePo4 possibility, the more excited I became over some of the great physical capabilities of this technology. After arriving in Southern California, I began researching everything I could about how to install these new batteries on Dazzler. I learned much from my research and information from Dan. Over voltage and under voltage protection was a must. Elite Power Solutions did sell an Energy Management System (EMS), cell sense boards and a video monitor for visualizing what the system is doing in real time. It had become clear that other equipment not offered by Elite Power Solutions had to be acquired prior to doing the installation. Before making my installation, I decided to draw a schematic of my installation to make sure I didn’t forget anything and to help in estimating lengths of wire, cable and parts needed for completion. Luckily, I have been upgrading many charging systems over the last few years. Those upgrades included a Victron MultiPlus 3000 inverter charger, Victron MPPT solar controller and a new Balmar MC 614 voltage regulator. All of this equipment has great flexibility to be configured for a wide range of battery types including LiFePo4 batteries. We discovered several different sources of LiFePo4 battery distributors in the US. Due to open communications with Elite Power Solutions located in Arizona, we discovered that grouping a purchase of LiFePo4 batteries and related equipment could save us some $$ off the overall investment. We gathered a few friends together and discussed the benefits and potential problems with LiFePo4 batteries and we all decided to group together and increase our purchasing power with Elite Power Solutions. We decided to place the order in late September 2016. The order was freight shipped on a pallet to San Diego. So this was my simple sketch of my instillation on Dazzler. I did not install the heavy amp on/off switches as I decided to use small on off switches to control the Gigavolt solenoids. Lucky for me, I was able to help install Larry Camp’s battery system on His sailboat Jana located in Ensenada, Mexico. The installation took all day and occurred without incidence. The largest consumption of time was the cut to fit 2/0 cable and crimping on the battery lugs as you go along. If you are very good at measuring and cutting the cables you could probably make all of these cables prior to installation. But, due to my excellent understanding of Murphy’s boating rules. I cut and measured as I did the installation to avoid those “Ahhh Sh**” moments and the wasting of parts/materials or excess money. The Gigavolt solenoids were used as over voltage and under voltage control via the EMS CPU. After the system was installed everything worked as expected. Fast forward a few more days and it was time to install the LiFePo4 batteries on Dazzler. I invited my friend John Gingold of SV Silver Seas to assist with my installation as he was also going to install LiFePo4 batteries on his boat. Having all of your parts and supplies ready to go before you start saves valuable time from having to stop and run to the store for something needed to complete the installation. The installation took all day and was operating successfully at the end of the day. Again, I prefer to cut the 2/0 cable and install as I go to have a custom fit and look when the installation is complete. Unlike Larry’s system, I had to account for four different charging sources. The Alternator, Solar power, Wind power and The Victron charger/inverter. I used a heavy gauge bus bar for connecting the charge sources and then connected it to the battery through one Gigavolt solenoid for over voltage. My Victron charger/inverter has to be run directly to the battery. The problem in doing that is it is not controlled by the EMS CPU directly. Victron technical support was contacted and through the use of two relays from the EMS CPU over and under voltage circuit, the Victron charger/inverter can be controlled simultaneously to shut off the charge function or inverter function as needed by the EMS CPU. This step allowed the Victron charger’s over and under voltage controls to be controlled by its own built in software set points. 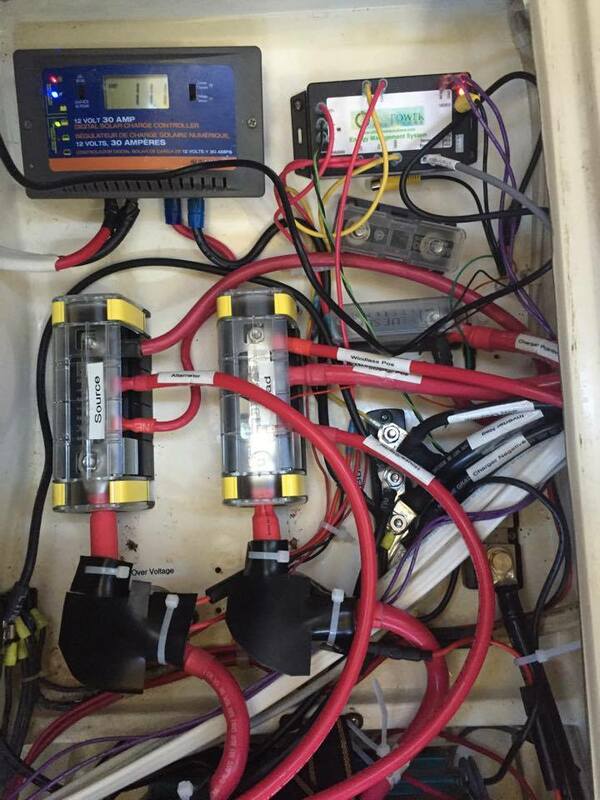 After 10 months of operation onboard Dazzler, I am absolutely happy with the results of making the conversion to LiFePo4 battery system. I chose to make one bank to simplify the installation. It is possible to have a separate start bank, but there is some additional equipment you would need to install to isolate the two banks and charge appropriately. You can even use a lead acid start battery, but keeping things as simple as possible was my goal. Battery management has never been easier. The fact of not having to top off batteries everyday has also added to the pleasure of power management. The voltage does stay around 13.2 volts for daily usage. All the way down to 80% of capacity. If a cloudy or no wind day happens that is no sweat for the system. Setting the charging parameters on your different charging systems takes a little time, but well worth the investment. Balmar regulators can be setup to handle the bulk, absorption and Float charge set points with ease. My solar charge controller also had the ability to configure easily. For the last two years I upgraded charging equipment and regulators with the intent of changing to the LiFePo4 batteries. That made my investment easier because the costs were spread out over time. Doing your homework and preplanning your system makes it much easier for installation. Yes there are some technical issues that need to be thought through. There is other charging equipment that will work with the LiFePo4 batteries, but either you or an equipment technician may have to configure your charging set points. With the Victron equipment, I was able to configure all the settings myself. I can also change those settings as needed in the future. Using older charging systems could possible add a level of frustration I did not want to deal with. Contacting manufacturer’s tech support to find out how you can modify or update older equipment for LiFePo4 may be something you don’t mind doing. I have had many instances with different manufacturers that result in finding out that my older equipment would not be compatible or not able to be modified for LiFePo4 batteries. Last year several computer and cell phones using Lithium batteries overheated and caused fire and or damage to electrical equipment. I understand that the lithium batteries used in those applications was not as stable as LiFePo4 battery chemistry and thus are susceptible to charging, overcharging or heat anomalies. That’s the story, the whole story and nothing but the story from the equipment installations on Dazzler. Fair Winds, tight lines, fish filled freezers and following seas. My source of LiFePo4 equipment came from Elite Power Solutions in Arizona. Do you have any more details on how the Elite Power Solution EMS interfaces with the Victron Multiplus Inverter? I’ve been scouring the documentation for the Multiplus and can’t figure out how to use an outside relay to turn off the charging function during an EMS detected over voltage. Likewise I can’t see how to use an outside relay to turn off the inverter function on an EMS detected under voltage. Thanks for the great write up. First off, you might need to have a Victron Mk2 or MK3 USB interface and an RJ45 cable for your MultiPlus to a Windows base computer to configure the relay switches. The Bosch style relay switches between the LiFePo4 BMS controller and the MultiPlus connect on the MultiPlus connection board to the K1 and K2 (normally closed positions). Your Bosch style relays should be connected to your BMS control wires that signal your contactors (solenoids) to open. This will connection will cause your Bosch relays to open as well and thus signaling your MultiPlus to shut down charging or the inverter. Using you MK2 or MK3 USB interface allows you to program what you want the MultiPlus to do when either of those relays are activated. I connected my positive cables from the MultiPlus to the charge source through the over voltage contactor. That way if the under voltage opens I would still be able to get a charge to the batteries. I hope that helps. Let me know if you have any additional questions.